Henry Khaaba Olonga (born 3 July 1976) is a former Zimbabwean cricketer, who played Test cricket and One Day Internationals for career span of 8 years. In domestic first-class cricket in Zimbabwe, Olonga played for Mashonaland and Manicaland. When he made his Test debut in January 1995, he was the first black cricketer – and the youngest person – to play for Zimbabwe. 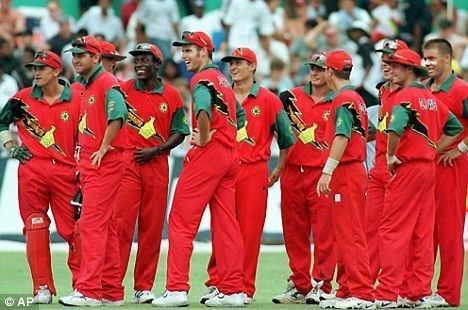 He was a regular member of the Zimbabwe team from 1998 to 2003. He was considered one of the fastest bowlers in international cricket, but also one of the more inaccurate, bowling many wides and no-balls. His international career came to an end in 2003 after Olonga and team mate Andy Flower wore black armbands during an international cricket match in the 2003 Cricket World Cup to "mourn the death of democracy" in Zimbabwe. Death threats forced him to live in exile in England. Olonga announced his retirement from international cricket after Zimbabwe's final game in the 2003 World Cup competition. Olonga and Flower were given honorary life membership of MCC later in 2003. Olonga was born in Lusaka, Zambia. His father was Kenyan and his mother was Zimbabwean. He has two sisters and two brothers. His brother, Victor Olonga plays rugby in Zimbabwe, and became captain of the Zimbabwe national rugby union team. The former Kenyan minister Francis Masakhalia is his uncle. After returning to Kenya, the family moved to Bulawayo in Zimbabwe. Olonga was educated at Rhodes Estate Preparatory School (REPS) and played cricket for the Partridges, the Zimbabwe national primary schools cricket team. He then attended Plumtree School, where he became head boy. He was involved in acting, athletics and rugby in addition to cricket. In a school cricket match against Brighton College, he scored 103 runs and took 8 wickets for 15 runs. He found a firm Christian faith in 1992 at a youth camp in Marondera. He was not an obvious or automatic choice when he was selected to make his international debut for Zimbabwe in the Test against Pakistan at Harare in January 1995, (although Olonga could have been selected to play for Zimbabwe against Sri Lanka earlier in 1995, when David Brain and Eddo Brandes were absent due to injury, but he was found to be ineligible as he still held Kenyan nationality). Having given up his Kenyan citizenship, Olonga became the youngest player to represent Zimbabwe in international cricket, aged 18 years and 212 days. 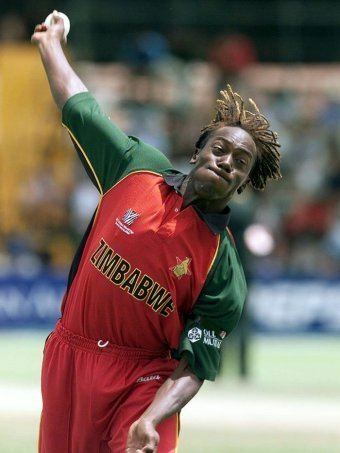 A right arm fast bowler, Olonga was also the first black cricketer to play for Zimbabwe, and the third Zambian-born Test cricketer after Phil Edmonds and Neal Radford of England. Zimbabwe beat Pakistan by an innings and 64 runs, the team's first ever Test victory, mainly due to a double century from Grant Flower, and centuries from Andy Flower and Guy Whittall. Olonga took the wicket of Saeed Anwar in his first over, but he was no-balled once for throwing. With help from Dennis Lillee, he rebuilt his action before returning to international cricket. He made his debut in ODIs playing against South Africa in October 1995. He was man of the match when he took his first 5-wicket haul (5–70) in Tests playing against India in October 1998, Zimbabwe's second Test victory, and he was the spearhead of the team that won Zimbabwe's first overseas Test, beating Pakistan at Peshawar in November 1998. He took a second and final Test 5-wicket haul (5–93) in a losing cause against Pakistan in November 2002. 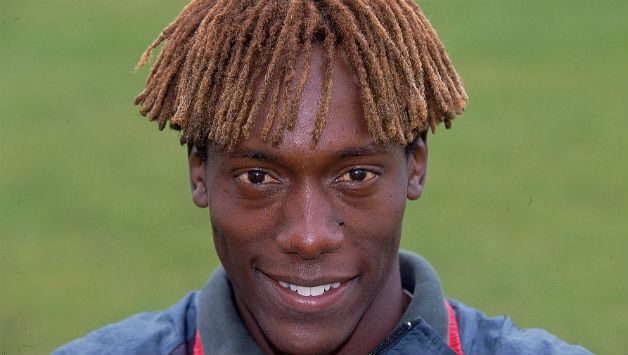 Olonga played 30 Test matches for Zimbabwe, taking 68 wickets with a bowling average of 38.52, and 50 One Day Internationals, taking 58 wickets at an average of 34.08. He holds the record for the best bowling in an ODI by a Zimbabwean, with figures of 6–19 against England at Cape Town in 2000. Olonga joined the Zimbabwe team at the 1996 Cricket World Cup in India, Pakistan and Sri Lanka. He was selected to play in Zimbabwe's final game of the competition, against India, but asked to be omitted as he was out of practice. He played in 7 matches in the 1999 Cricket World Cup in England. He was selected for the Zimbabwe team at the 2003 Cricket World Cup, held in South Africa, Zimbabwe and Kenya. Some of the countries playing in the tournament were concerned about security: New Zealand had refused to play in Nairobi, and England refused to play in Harare. Flower scored 39 runs, Olonga conceded 8 runs from 3 overs but took no wickets, and Zimbabwe won the match. Their protest was supported in the world press and more widely internationally, but caused a political storm in Zimbabwe. The minister of information Jonathan Moyo labelled Olonga an "Uncle Tom" with "a black skin and a white mask". Despite the protest, Flower continued to play for Zimbabwe in the tournament, but Olonga was omitted from the team for six matches, ostensibly on grounds of his poor form (including a walkover against England who refused to travel to Harare). Olonga was selected to play in one more World Cup match, against Kenya at Bloemfontein in the Super Sixes stage of the tournament on 12 March. A warrant was issued in Zimbabwe for Olonga's arrest on charges of treason. Death threats made him go temporarily into hiding, and then into exile in England after Zimbabwe's last match of the tournament, against Sri Lanka in East London. A knee injury forced his retirement from first-class cricket later in 2003, but he has played occasional matches since 2005 for the Lashings World XI. By 2010, he was calling for the restoration of international cricket between Zimbabwe and other countries. Olonga met physical education teacher Tara Read while both were attending the Australian Institute of Sport's cricket program in Adelaide. The couple married in 2004. On Friday 13 October 2006, Olonga won Five's The All Star Talent Show with 50% of the overall votes. He is now pursuing a career as a cricket commentator and singer and released an album Aurelia in 2006. His autobiography, Blood, Sweat and Treason, was released in July 2010 by Vision Sports Publishing and was longlisted for the William Hill Sports Book of the Year 2010.